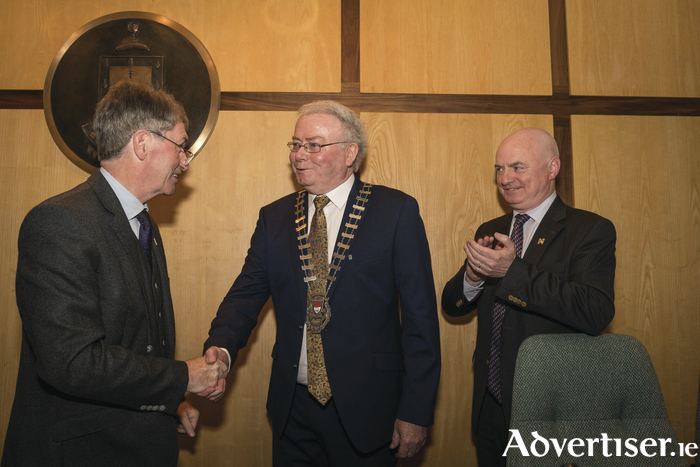 It was a historic day last Monday when Independent Cllr Richard Finn followed in the footsteps of his father Martin, in becoming the first citizen of the county, when he was elected to the position of Cathaoirleach of Mayo County Council. The independent councillor was elected to the position as part of a deal between Fianna Fáil and a group of independents who control the local authority following the 2014 local elections, he becomes the second independent councillor to wear the chain this council term after Cllr Michael Holmes previously held the position two years ago. The Claremorris-based councillor was unanimously elected to take over the position from Fianna Fáil Cllr Al McDonnell, with the no other party putting forward a nominee for the position. Cllr Finn's late father Martin served as the Cathaoirleach for four years in the 1980s, Richard Finn succeded his father in the council in 1987 and was returned as a councilor up until 2004, when he lost the seat - but he regained a seat in the council in 2009 and was relelected again in 2014. Cllr Finn thanked his partner Rena and his family and his supporters for their support over the years after he was elected to the position. Outlining his priorities for the year he said he wanted to see continued support and growth for Ireland West Airport Knock, the retention and improvement of courses in GMIT Mayo as two of his top issues. Also last Monday, Fianna Fáil Cllr John Cribben was elected as the Leas Cathaoirleach for the year.